There are times when life events are greater than us. There are times when we do all we can do, but it is still not enough. There are times when we are out of options. Does trying really matter? Does it make a difference that you tried? Didn't I say in a previous blog that no one cares if you tried and all that matters are results? Yes, that is true, trying does not matter to anyone, but it does to your state of mind. You trained your entire life in Krav Maga. You are also highly skilled with weapons; handguns, rifles, but...now you are surrounded, God forbid, by a team of former Special Forces turned professional killers with their guns aimed at you. They are standing on the top of a building with sniper rifles, they are directly in front of you, and behind you. Well, time to call Chuck Norris or Arnold Schwarzenegger. But what if this is reality and not a movie? Nothing you can do. One thing you can do is know that you have no more physical options left. This understanding, this peace of mind if you will, will allow you to consider remaining options; diplomacy, negotiations, compromise, or, I hate to say this, a peaceful acceptance of death. We like to believe that everything is possible, but sometimes it is not. We live during pretty good times. In most places in the world we live the "American Dream" where ...if we work hard enough anything is possible, all our dreams can come true. But this is still not always the case and during most of history was never the case. There is an old saying, If you were born a donkey you will always be a donkey. If you were born a serf in the 15th century odds are that no matter how hard you tried you would never be more than a serf. Trying would not change your fate. You would have to wait a few hundred years for that. Sometimes your efforts would bear fruit, but you would not live to see it. You might set a revolution in motion, but it would only bear fruit a hundred years after your death. And sometimes our greatest efforts are still not enough, sad but true. The difference is that we know we did our best, but sometimes..."the wall was just too high". This is not a "giving up" attitude, no, just the contrary! It is an attitude of saying I will do everything in my power, give my greatest effort even though I know there is a chance I will not succeed. Admitting the limitations of life, the limitations of our personal abilities is not negative. The positive attitude is that despite my limitations, despite the fact that all my efforts might still not be good enough, I still try! And if that sad moment comes, when we realize that "the wall was just too high" we have the peace of mind of knowing we did all we could do. We have no regrets. There is no little voice in our heads saying, "if only I had tried harder". Some of us will never make it into law school, we may have to choose something else for a career. Some of us may not have what it takes to be a doctor, but if we gave our best shot we shall have no regrets later on in life. We shall be at peace with ourselves. In every competition there will be a winner and a non-winner. If you lost you can spend the entire off-season angry at not being properly prepared. But if you did your best, you prepared you best, but your local neighborhood baseball team was playing the 1927 New York Yankees, well, you may just have to concede defeat. The better team won. In Krav Maga our aim is survival. Our goal is to give you the maximum tools to survive, to minimize damage, to walk away. Sometimes one may face situations that are hopeless. Sometimes it is the Jews of Masada against the greatest Roman legions. Sometimes victory is not in the cards. And yet, we prepare the best we can. We give it our best. 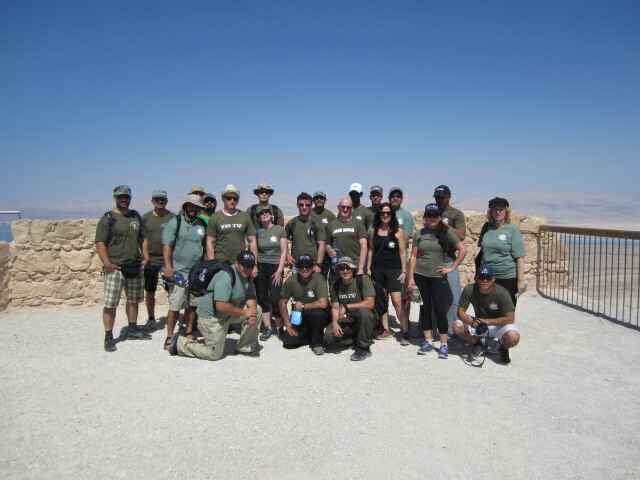 IKI Krav Maga Tour and Train Israel Experience June 2013 on top of Mt. Masada. Here we learn a true story of bravery, the story of 960 Jewish men, women, and children against the best of the Roman Legions. Here we learn about giving it your all despite all odds, even when the situation is hopeless. Experience Israel and Krav Maga by living it for two weeks.